Curry leaves (kadipatta in Hindi and Marathi) are one of my favorite spices. For the sake of fresh curry leaves, I frequently trek to Queens to the Indian store rather than do without them. Curry leaves should not be mistaken for bay leaves, these two are worlds apart. Curry leaves add a fresh citrusy fragrance to food that is simply unmistakeable. 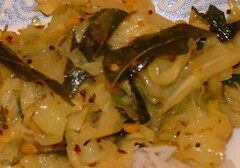 The recipe I have chosen to showcase curry leaves is a very simple cabbage subzi. Subzi is the general name for dry vegetable stir-fries. These can be eaten with roti/bread or with rice and lentils. To increase the protein content of my vegetarian diet, I often make subzis with added lentils or peanuts as shown in this recipe. Heat oil in a pan. Add mustard and cumin seeds, let them splutter and then add onion and curry leaves. Stir fry for 3-4 minutes on medium heat till onions have softened. Add turmeric, red pepper flakes, salt to taste and stir for a few seconds. Add the cabbage and chana dal and stir around to coat them with spices. Add 1/4 cup of water and let the cabbage simmer for 10-15 minutes, uncovered, stirring occasionally. The subzi is done when the cabbage and chana dal is tender and the preparation is almost dry. Garnish with cilantro and dress with lemon juice just before serving. This is just the way we make in Tamil Nadu minus the onion though. My mom adds grated coconut towards the end of cooking. Hi Nupur - this sounds wonderful! I've yet to prepare any Indian food myself, but this sounds like a good place to start! 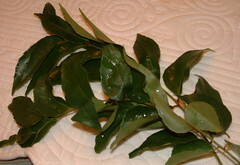 I've never been sure - do you eat the curry leaves or remove them like bay leaves? I forgot to mention it so thanks for reminding me, yes, you do remove the curry leaves before eating...though they are not as tough as bay leaves and can be eaten anyway. I love your blog and am a recent visitor. Thanks for all your recipes.. I know that curry leaves can be eaten, but can bay leaves? I've seen them used but mainly for flavour then removed later.